Businesses need to be prepared for any and every eventuality. Yet, all the planning in the world may not fully prepare you when an unexpected disaster strikes. It’s a lesson Sodexo Canada – a global provider of management and quality of life services such as housekeeping, maintenance and food service – learned quickly when its head office in Burlington, Ont., caught fire in February 2017. On Friday, February 10, as Sodexo’s employees were heading out for a team appreciation lunch, the building’s fire alarm went off. Thinking it was just another fire drill, the team evacuated the office along with the building’s other tenants. Some of the staff, driving away to their lunch destination, looked back to see white smoke rising from the roof of the five-storey structure. The smoke quickly turned an ominous black, and almost instantly, flames began to shoot upwards. Luckily, the entire building was emptied in time, and nobody was hurt – yet the experience will remain forever etched in witnesses’ minds. Though Sodexo’s Burlington office is staffed by approximately 100 employees, it services all of the company’s 750 sites in Canada, home to over 10,000 people. Critical systems such as payroll, marketing, purchasing, finance, IT and human resources are all centralized through servers and equipment housed in Burlington. As the afternoon of the fire wore on, and damage began to be assessed, Meehan and the rest of the management team began to take stock of the situation. In addition to re-equipping their head office employees, there was the matter of the payroll set to be processed on Monday morning. The inability to do so would mean thousands of people would not get paid. Many Sodexo employees also work on Microsoft’s Exchange, which is hosted on servers residing in Burlington; their ability to do their jobs would also be affected. With time not on their side, Meehan and the crisis management team began to prioritize a list of things to do. Jeremy Dickson, Lead Systems Engineer and Ken Booth, Senior IT Manager recognized the need for office space and immediately contacted their property manager to inquire if any commercial space was available nearby. As luck would have it, the office building across from their original location had a vacancy. The team was able to start moving in that very afternoon and immediately began planning how to equip the new, temporary space. Meehan called CDW Canada, which had been supplying Sodexo Canada with IT equipment and solutions for a number of years. The two had been discussing and working on a project to introduce a hyperconverged system into the company, with a plan to do a complete tech refresh and virtualize its physical servers over the coming months. The fire, however, precipitated that work be done in a matter of days. Armed with an order list including multiple desktops, laptops, select software and servers, CDW Canada worked feverishly over the weekend with its buyers and product directors to secure the much-needed equipment. 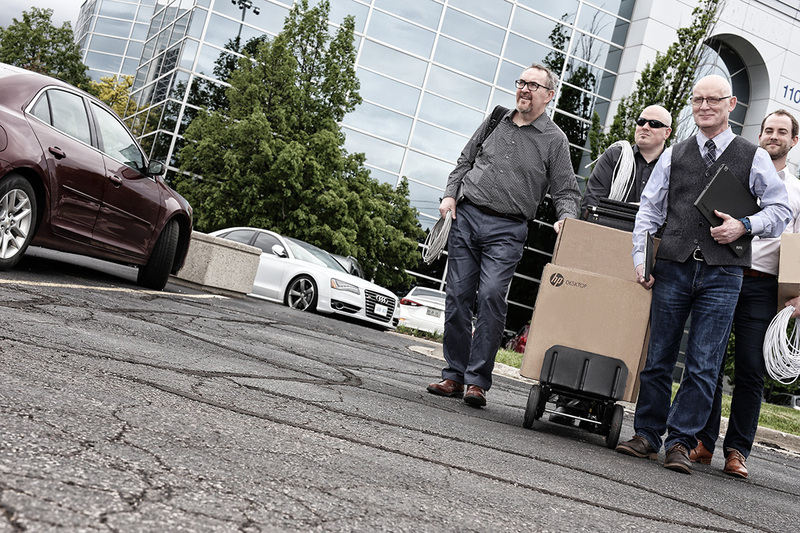 Securing the hardware was just the first step – CDW Canada also worked with a third-party distribution centre to image and asset tag all the laptops and desktops; a process that usually takes three days but now had to be done virtually overnight. CDW Canada also worked closely with CDW’s U.S. account team, as some of the hardware required was not in stock in Canada. The account manager worked closely with Sodexo to facilitate the shipment across the border, securing the necessary approvals with customs brokers to expedite the shipment. Arriving from the U.S. was one of the coveted servers – the other being supplied domestically. Both, however, had to be shipped to Montreal before their final Burlington destination in order to have the Exchange environment rebuilt. Meanwhile, the Sodexo team worked throughout the weekend, shopping for new tables, chairs, printers, paper, and other office amenities. They also worked with their U.S. counterparts, digesting back-up data to create virtual servers to start rebuilding their environment. By Monday morning, Sodexo had received the necessary emergency equipment to conduct business. Payroll transmissions were received as scheduled, and employees from across the country were able to do their jobs with no disruption. Months later, the rebuilding of Sodexo Canada’s head office continues, however. New equipment continues to come in on a regular basis as the company prepares to eventually move back to its original location once all repairs have been completed. Nevertheless, Meehan and his team look back on that long, long weekend with a sigh of relief.